The decline in newspaper advertising sales appears to have abated significantly in the first three months of the year. While this has cheered the embattled industry, it must be noted that a decelerating rate of decay should not be confused with healthy growth. 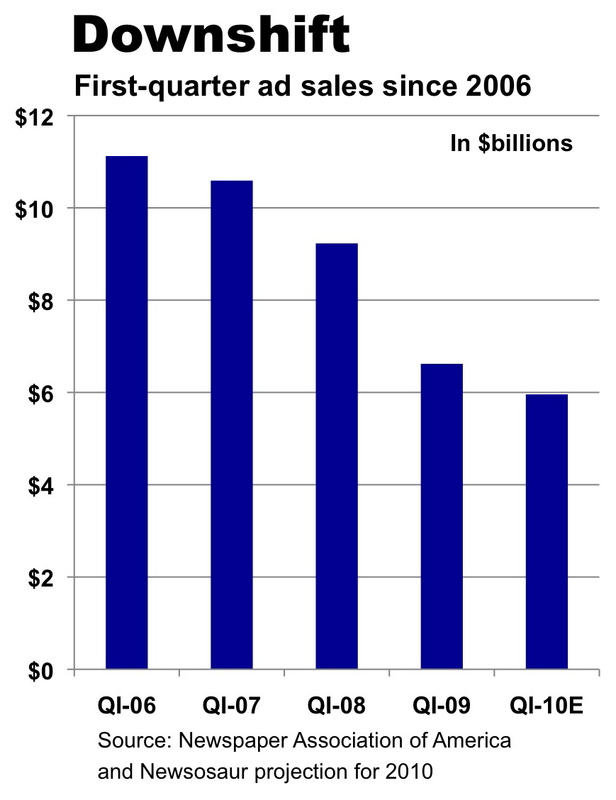 The industry, as discussed below, has lost nearly half of its principal revenue base in the first period since 2006 – and it has yet to find bottom. A survey of the six publicly held publishers that to date have reported their performance for the first three months of 2010 found that their ad sales on average fell 10.2%, as compared with drops of 28.3% in the first period of 2009 and 12.8% in the first quarter of 2008. Lee Enterprises and Gannett reported the strongest of the weak sales, falling respectively 7.7% and 7.9%. The worst performers were Media General, Journal Communications and McClatchy, whose sales tumbled respectively 13.1%, 12.1% and 11.2%. The New York Times Co. was in the middle, with sales dropping 9.1%. The Newspaper Association of America generally publishes the complete and definitive sales results for the first quarter late in May. Assuming the performance of this well-diversified group of publishers is representative of the industry, it appears that total ad sales for newspapers will come in at approximately $6 billion for the first three months of this year. 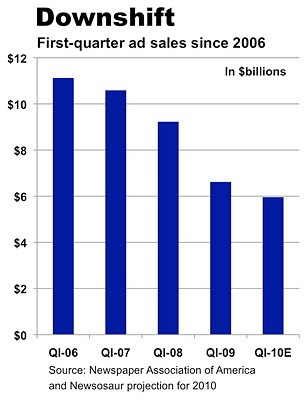 If this is so, then ad sales for the first quarter of 2010 will be some 46.4% below the $11.1 billion in sales recorded in the same period in 2006, which may well stand forever as the best first quarter in the history of the business. The trend is illustrated in the chart below. If sales for the first quarter this year indeed come in at $6 billion, they will be the lowest for the period since 1986, according to data published here by the NAA. Adjusted for inflation, the 1986 figure is worth $22 billion in 2010 dollars, according to the U.S. Bureau of Labor Statistics. In first-quarter earnings calls to the small fraternity of securities analysts who still cover newspaper stocks, publishers were cautiously optimistic that sales would continue to firm for the balance of the year. Many papers have seen increases. Perhaps this is a trend.